Smart watch connect through bluetooth,easy to operate,multi useful function,healthy and fashionable,fit for various different occasions such as during sport,fitness,travel,driving and so on.This smart watch will be your best companion of life. Android Phone can use this watch's all functions. Other smartphones(such as iPhone) can't use parts of functions which need APP such as remote capture,messages, remote notifier.For iPhone,it only supports partial functions including Pedometer, Calendar, Call Sync, Calculator, Clock, Stopwatch, Music player,Handsfree,ect.so we recommend that you should note your phone model before your purchase. ☛SYNC FUNCTION:This smart watch will vibrate, display caller ID or number you can answer or reject on your wrist.and it will also remind you when there is new messages in your cellphone.It can receive messages from Facebook, Twitter, WhatsApp, Skype, Gmail and so on.You will not miss any important calls and messages anytime and anywhere such as during sport,fitness,driving or the other activity. ☛TWO WORKING MODE - One is company mode(Bluetooth Smart Watch), It enable to make and answer call via Bluetooth.Receving messages from your cellphone such as facebook whatsapp and after you download the APP on your Android smartphone. The other one is Network mode(Sim Card inserted). It enable to make call and read and text messages via the SIM card you inserted. ☛FOCUS ON YOUR HEALTH:This smart watch will let you like sport much more.It will count your move steps and time.Sedentary Reminder:remind you to have rest to avoid being tired.Sleep monitor can track the quality of your sleeping.Compatible all of the android smartphones such as Samsung,LG,Huawei,HTC,LG,Sony and so on.The other smartphones can support bluetooth connection. ☛STYLISH APPEARANCE & MULTIFUNCTIONAL SMART WATCH:Unique and fashion design,you will get an awesome fashion experience.Support anti-lost,phone book,remote camera,alarm clock,calendar,music player,notification push,handsfree calls and so on.Bluetooth 4.0 smart wristwatch, support android 4.4 or above; 300 mAh battery life, up to 24 hours standby time, 1.54 inch IPS HD touch screen, 240*240 pixels,you can wear it comfortably all day, perfect for sports, traveling or daily use. 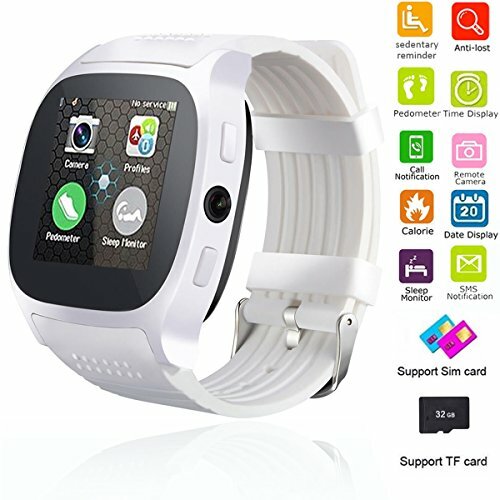 ☛PLEASE NOTE:Android Phones can use all functions on this smart watch.Other smartphones(such as iPhone) can't use parts of functions which need APP such as remote capture,messages, remote notifier.For iPhone,it only supports partial functions including Pedometer, Calendar, Call Sync, Calculator, Clock, Stopwatch, Music player,Handsfree,ect.so we recommend that you should note your phone model before your purchase.